Quick Erase is a utility, developed by Rizonesoft, that you can use to completely overwrite the contents of a file on a disk drive. Deleting a file in Windows does not mean the file disappears from the hard drive. Instead, the sectors that file occupied can now be overwritten by newer files being written to the disk. That means you can use file recovery programs to restore previously deleted files. In the case of an accidental deletion, this is a positive reality, but when it comes to sensitive private information, many users would prefer to know it cannot be recovered. Quick Erase gives multiple options for overwriting files, up to 23 passes. 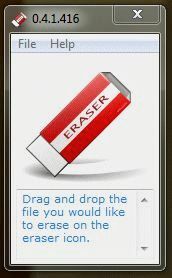 Files and folders are erased by simply dragging and dropping them onto the Quick Erase window.